All other Premium Tools can be accessed on the premium dashboard. Welcome to the Premium Starting Pitcher Matchups Tool, bringing you the schedules and Matchup Ratings for a pitcher's next ten projected starts. The full version of this tool is exclusive to RotoBaller Premium Subscribers. 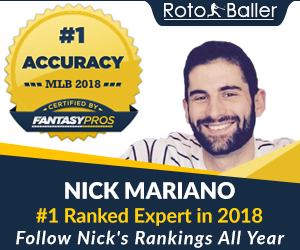 To access the rest of RotoBaller's Premium tools & content click here. This tool will help you look at the next few projected starts for a given starting pitcher and analyze the matchups. Select a pitcher from the above menu and we will show you the next 12 projected starts/matchups. Pitching rotations and starter schedules change often, so this list will be updated automatically as the MLB teams adjust their rotations on a day-to-day basis. The matchup rating will also help you determine if it's a recommended matchup. The higher the matchup rating number, the better the matchup.